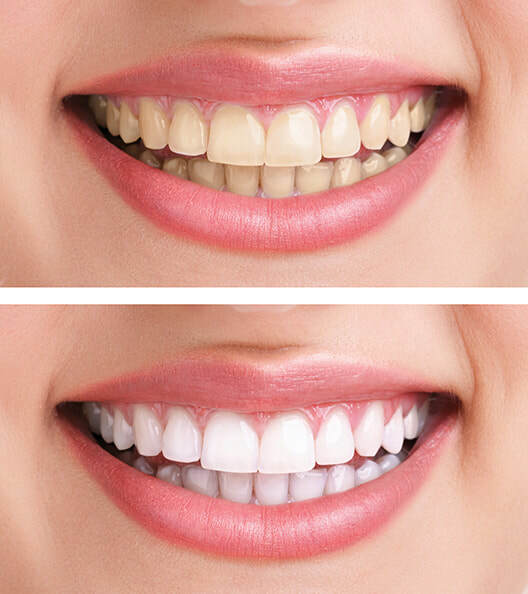 Teeth whitening is a simple and effective method of lightening teeth. Everybody’s teeth darken and yellow with age. Tea, coffee and colas all speed up the process. Smoking and other staining agents also contribute to darkening of teeth. The whitening technique removes the staining agent that has penetrated deep within the tooth. The degree of whiteness achieved will vary from patient to patient and with the type of bleaching process chosen. We can advise upon the suitability of treatment based upon your teeth and gum condition. At Preston House Dental, we use Philips Zoom Home-Kit with amazing results. This requiries the use of custom made trays over a period of time at home. To start the process we take impressions (moulds) of your teeth. These impressions are sent to a laboratory where a technician fabricates custom made trays designed to fit closely to your teeth. This customisation allows for maximum contact between the whitening gel and your teeth. A whitening gel is syringed into the trays and these are seated over your teeth for anything from an hour to overnight. Successful whitening can normally be achieved after two or three weeks, however, this may vary with the level of discolouration. At Preston House Dental we offer the Iman Aligner which can achieve fantastic results in as little as 8 to 16 weeks. This discreet appliance is a removable brace that must be worn for at least 22 hours for the brace to work. The Iman Aligner is a popular choice for patients wanting a quick and cost effective solution to straighten front teeth. Veneers improve the appearance of chipped, worn, irregularly shaped and heavily filled teeth and achieve a beautiful smile. Veneers are thin shells of porcelain that are custom made and bonded to your teeth. They are incredibly strong and durable and have a very natural appearance. With regular examinations and good oral hygiene measures, veneers generally last around 10 years or more. Before the finished veneers can be fitted to your teeth, we must remove a thin layer of enamel from the front of the teeth. This makes space for the veneers and helps bond the porcelain to the teeth by roughening the bonding surface. A thin layer of dental adhesive is then applied to your teeth, and the veneers are placed. The process can sometimes take several visits, however in select cases, you may not require any preparation of your teeth.